Mutant sporozoites were motile and developed into EEFs in vitro (in HepG2/CD81 cells) as efficiently as control parasites, but were poorly infective to mice in vivo, especially when administered through mosquito bites, the natural transmission route.RON4-mCherry is expressed in both oocyst-derived and salivary gland sporozoites, with an apical distribution consistent with rhoptry localization. Mutant sporozoites were motile and developed into EEFs in vitro (in HepG2/CD81 cells) as efficiently as control parasites, but were poorly infective to mice in vivo, especially when administered through mosquito bites, the natural transmission route. Normal numbers of salivary gland sporozoites. Injection of 100 sporozoites revealed that Py plp1/spect2 sporozoites were significantly less infectious than Py WT sporozoites (1 out of 10 mice developed blood stage parasitemia). When infection was delivered by five mosquito bites, all Py WT infected mice but none of the Py plp1/spect2 infected mice developed blood stage infection. Increasing the challenge to 15 infectious bites resulted in 7% of Py plp1/spect2 infected mice developing blood stage infection, with a greater than one-day delay to patency observed for infected mice of both groups compared to Py WT. Reduced hepatocyte cell traversal in vitro. Normal/higher hepatocyte invasion rate in vitro compared to wild type. Mutant sporozoites were motile and developed into EEFs in vitro (in HepG2/CD81 cells) as efficiently as control parasites, but were poorly infective to mice in vivo, especially when administered through mosquito bites, the natural transmission route.RON4-mCherry is expressed in both oocyst-derived and salivary gland sporozoites, with an apical distribution consistent with rhoptry localization. See additional information about rhoptry discharge and release of RON4-mCherry in transient vacuoles (TVs) and in the PV of infected hepatocytes. Injection of 100 sporozoites revealed that Py plp1/spect2 sporozoites were significantly less infectious than Py WT sporozoites (1 out of 10 mice developed blood stage parasitemia). When infection was delivered by five mosquito bites, all Py WT infected mice but none of the Py plp1/spect2 infected mice developed blood stage infection. Increasing the challenge to 15 infectious bites resulted in 7% of Py plp1/spect2 infected mice developing blood stage infection, with a greater than one-day delay to patency observed for infected mice of both groups compared to Py WT. Reduced hepatocyte cell traversal in vitro. Normal/higher hepatocyte invasion rate in vitro compared to wild type. Mutant sporozoites were motile and developed into EEFs in vitro (in Hepa1-6 cells) as efficiently as control parasites, but were poorly infective to mice in vivo, especially when administered through mosquito bites, the natural transmission route. Normal numbers of midgut- and salivary gland sporozoites are formed. Sporozoites showed wild type gliding motility. Sporozoites had lost cell passage ability (membrane-damaging capacity) as shown in the cell-wounding assay. Compared to wild type sporozoites, the mutant sporozoites were rapidly immobilized in the dermis. Mutant sporozoites were shown to be arrested by and invade dermal fibroblasts. Normal numbers of midgut- and salivary gland sporozoites are formed. Sporozoites have a strongly reduced infectivity to rats after intravenous injection of sprozoites and strongly reduced numbers of exoerythrocytic forms (EEFs) in frozen sections of rat livers were counted 24 h after sporozoite inoculations. No difference was noticed between wild type and mutant parasites in number, size, and fluorescence intensity of EEF at 4, 12, 24, or 48 hr in rat or mouse primary hepatocytes. Sporozoites show in vitro a 'rapid invader' phenotype, as a result of the lack of cell traversal. Mutant sporozoites show an adhesion/attachment phenotype (to CRL-2017 cells in vitro) which is comparable to wild type sporozoites. Sporozoites have a strongly reduced infectivity to rats after intravenous injection of sprozoites and strongly reduced numbers of exoerythrocytic forms (EEFs) in frozen sections of rat livers were counted 24 h after sporozoite inoculations. Sporozoites formed normal numbers of EEFs in hepatoma cells (HepG2), indicating that they retain normal infection ability. Sporozoites had completely lost cell passage ability as shown in the cell-wounding assay. Cell-passage activity was estimated by the number of cells wounded by sporozoite passage, which were identified by cytosolic labelling with FITC-conjugated dextran.In Kupffer cell-depleted rats, the sporozoites had restored liver infectivity. Parasitaemia after inoculation of mutant sporozoites was remarkably increased in Kupffer-depleted rats, becoming similar to that after inoculation of wild-type sporozoites In addition, the numbers of EEFs formed in the liver were also similar between spect2-disruptants and the wild type. 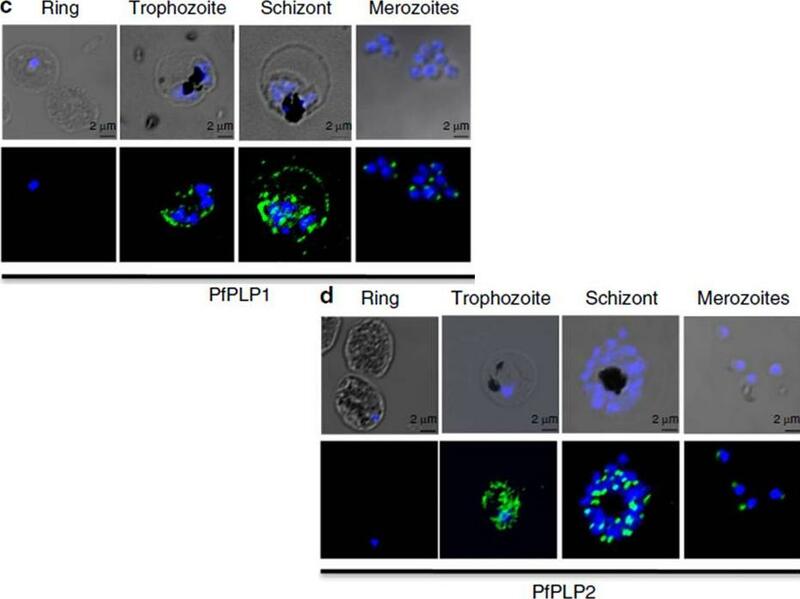 Change in localization of PfPLP1 to host cell membrane during egress of merozoites. (a–d) Schizonts were stained with anti-PfPLP1 followed by anti-mouse Alexa-Fluor 488 (green) and membrane-specific linker dye (red; PKH26 Red Fluorescent Cell Linker Dye) at different time points (B44–48 hpi) during egress. Three-dimensional reconstruction of confocal z-stack images of schizonts was done using Imaris software. PfPLP1 is represented as green dots and membrane dye is shown as two concentric rings corresponding to RBCM and PVM in red. The insets show a bright field and single-slice images with deconvolution. (a) Early schizonts do not show PfPLP1 on the two limiting membranes but shows punctate staining within parasite. (b) Mature schizonts show ring-like staining of PfPLP1 that colocalizes with the membrane dye, suggesting its presence on the membrane. (c) Upon rupture, linker stains the merozoite cell membrane and PfPLP1 shows punctate staining in merozoites with linker staining its cell membrane. 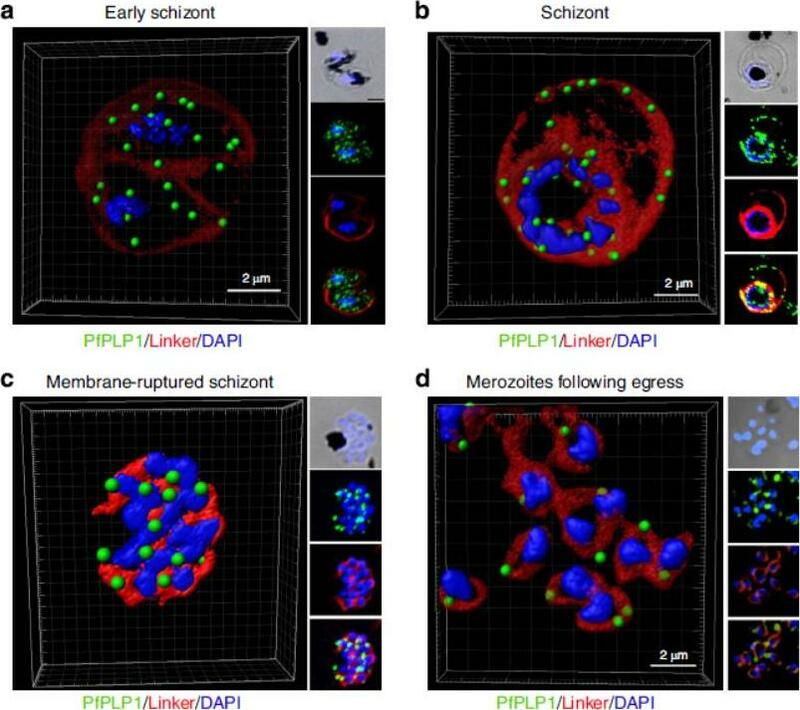 (d) After egress, free merozoites show apical localization of PfPLP1. 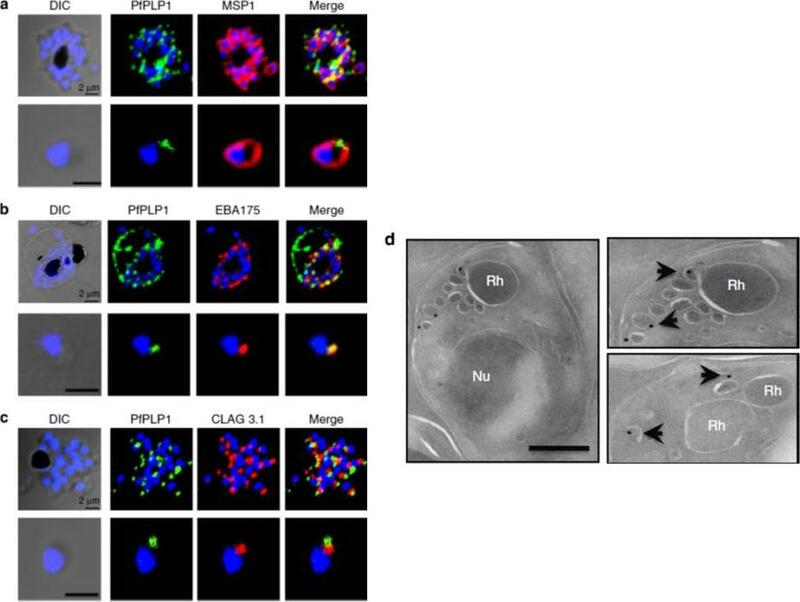 PfPLP1 localizes to RBCM and PVM during egress.Garg S, Agarwal S, Kumar S, Shams Yazdani S, Chitnis CE, Singh S. Calcium-dependent permeabilization of erythrocytes by a perforin-like proteinduring egress of malaria parasites. Nat Commun. 2013 Apr 16;4:1736. Stage-specific expression of PfPLP1 and PfPLP2 in the blood stage of P. falciparum. Expression of PfPLP1 and PfPLP2 starts in trophozoite stage, with maximal expression in schizonts. In mature schizonts, PfPLP1 and PfPLP2 show punctate staining at the apical end of merozoites. PfPLP1 also shows a ring-like staining, suggesting its localization to RBC membrane. Scale bar, 2 mm.Garg S, Agarwal S, Kumar S, Shams Yazdani S, Chitnis CE, Singh S. Calcium-dependent permeabilization of erythrocytes by a perforin-like protein during egress of malaria parasites. Nat Commun. 2013 Apr 16;4:1736.